Unless you have been exploring Jupiter during the past few years, you will have heard, clicked or read news stories about library closures up and down the UK. These havens of peace and quiet are disappearing from our neighbourhoods almost as quickly as record shops, pubs and fishmongers. Numerous luminaries such as Clash founder Mick Jones, Nick Cave, Tamsin Greig, Alan Bennett and Hugh Laurie have all recently devoted their energies to saving local reading rooms from being turned into a Strada or a KFC. To that end, local authorities have been coming up with cunning plans to fund existing libraries and (hopefully) prevent them from closing prematurely. 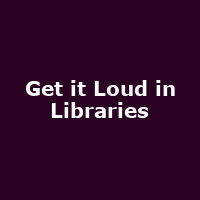 In the north of England, the award-winning Lancashire-based project Get it Loud in Libraries is doing just that. With a simple strapline - "designed to give people a damn good time in a library" - GILIL have unveiled a string of exciting concerts, all based in a selection of local libraries with reasonable ticket prices and no overpriced beer. None, in fact. Katy B is the latest artist to announce a trio of library shows for the summer, starting with Oldham on 4th June then Rugby on the 6th and finally St. Helens on the 8th. The South London dubstepping chart star will pack 'em into these intimate spaces without too much problem, with prices starting at £16.50. Her only other UK shows this year are at big festivals, so this is a great chance to catch her on her own. Not to be outdone and following previous shows from The Civil Wars, SBTRKT and Imelda May, Lancaster's Central Library also has a clutch of renowned artists lined up to perform during 2012, starting with melodic Mancunians Team Me next Wednesday (2nd May - £6.50), Welsh singer Jodie Marie on 14th May (£7), US downbeat-maestros Low on 9th July (£17.50), new indie-rock upstarts Howler on 11th July (£10) and Geordie pop-folk icon Beth Jeans Houghton on 23rd September (£10). All the shows are low capacity so best grab those tickets quick!